“I put in a long apprenticeship at the San Carlo: for the first three years I did nothing but scrape the pans. They had to be perfectly clean; if I made a mistake I got a rap on the knuckles,” Maria Grammatico says in in Bitter Almonds – Recollections and Recipes from a Sicilian Childhood by historian Mary Taylor Simeti. In Italy, the nuns are the keepers of the ancient almond flour cookie and cake recipes. Profits generated from the baked goods sold were critical to keeping the convents afloat and particularly so during the post-war depression. When Maria opened her shop, some say as an act of revenge against the cruelties suffered at the hands of the nuns, she placed those delicious secrets on display. 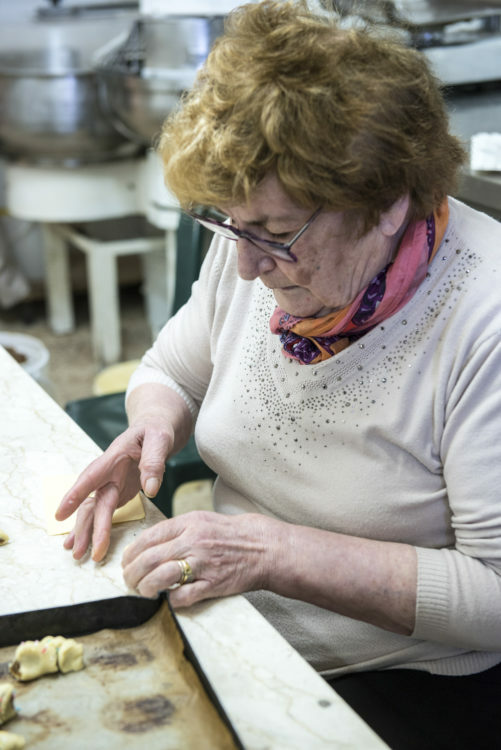 When I meet her, now 78, at the shop’s second premises in Via Vittorio Emanuele that she moved to in 1975, she ushers me into her pristine kitchen. In front of Maria is a tray of elegant cookies filled with fig paste called the buccellati that she twists deftly in a knot and sprinkles with hundreds and thousands. Ornately painted marzipan frutta or fruit are piled on fancy silver trays. Precious pistachio nuts, called “green gold”, grown in the shade of Mount Etna in the east of the country are dusted over some pastries. A mixed box of cookies to gift is weightier than three boxes of chocolates of the same size. I decide to eat my fill while driving through Sicily with my husband. It was Goethe, in 1786, who said that to see Italy without having seen Sicily is not to have seen Italy at all. “For Sicily is the clue to everything,” he continued. Today, the shadow of the mafia, a reputation that remains hard to shake, follows the country. 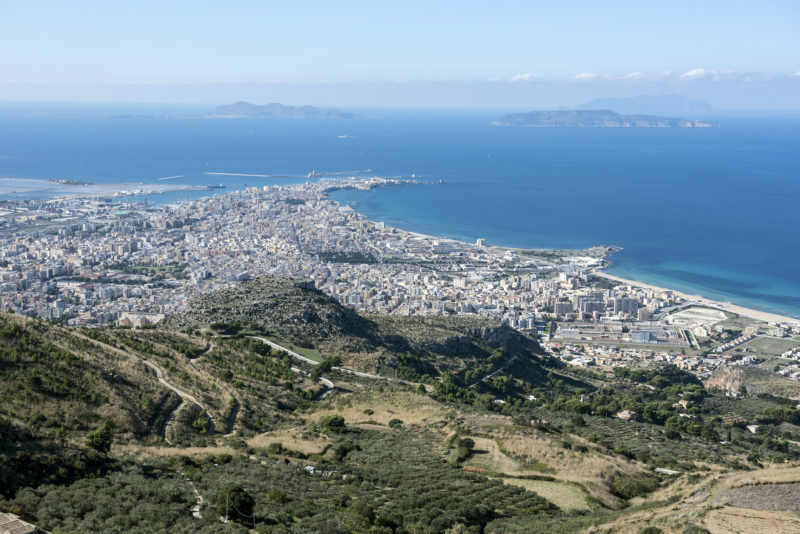 Locals become understandably annoyed when the mafia is mentioned as a foreigners’ first association with Sicily. It’s not without irony that roving street bands play strains of Nino Rota and Carlo Savina’s masterpiece from Francis Ford Coppola’s The Godfather, one of the most lauded big-screen gangster movies, romantising the Sicilian mafia in the U.S. The bands weave between diners on the cobbled square of the fish market in Catania where families gather in the humid evenings to feast of a bounty of seafood. At Trattoria Il Mare, the fresh fish crudo is cut paper-thin, the crab legs are sweet and the lobster still wriggling in tanks – diners chose from a selection available each day. 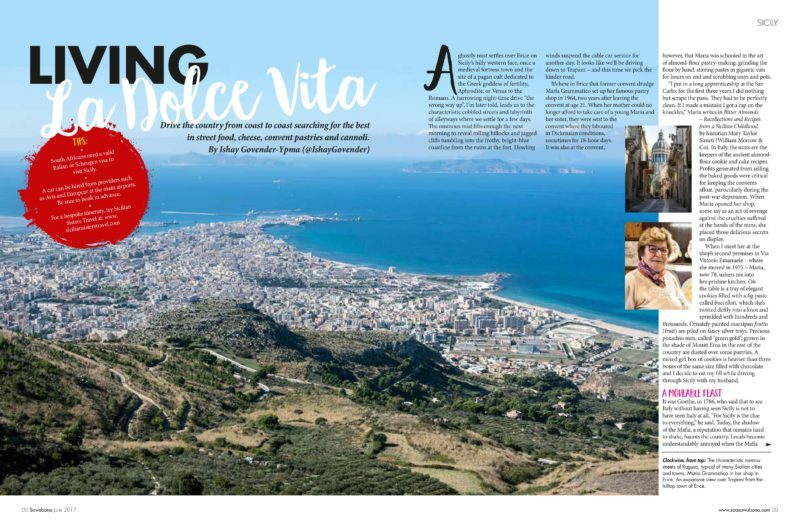 I travel from Catania in the east down to Syracuse, Ragusa and Noto in the south, to the western mountains of Erice and the bay of Trapani, the flash of Palermo in the northwest and to the craggy tops of the resort-town Taormina in search of the tastes that define the land. 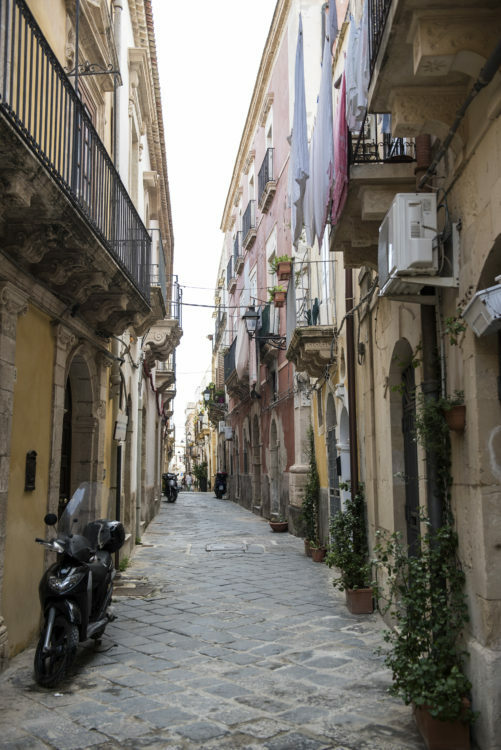 A constellation of socio-economic reasons has kept Sicily the poorest region in Italy and it’s visible to tourists in the run-down buildings and perpetual listlessness in the countryside. The food, like most of Italy’s best, has peasant origins. Pasta alla Norma, the classic and definitive dish of Catania combines the holy trinity of sun-sweet tomatoes, aubergine and salty aged ricotta – aubergine being the poor man’s meat. 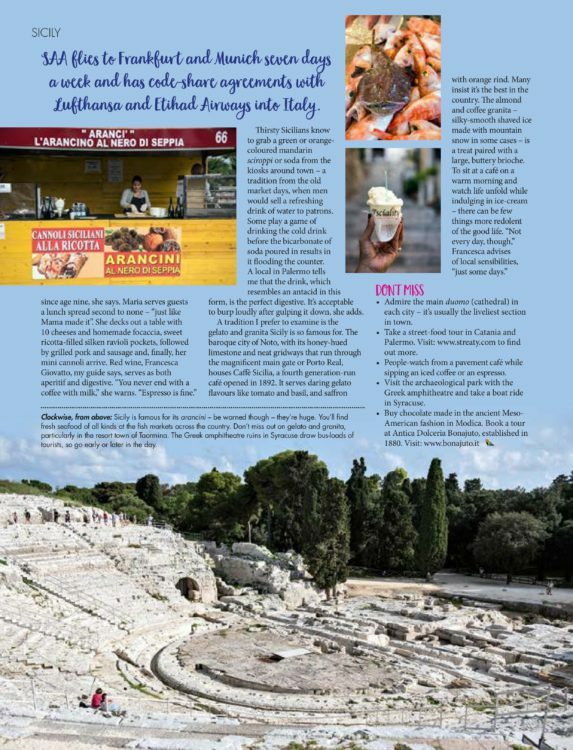 Arab influences punctuate the Sicilian plate – think saffron, marzipan used to make frutta, cassata topped with candied fruit, ricotta-filled cannoli, seafood couscous from Trapani and pasta dishes featuring sardines, pine nuts and raisins. 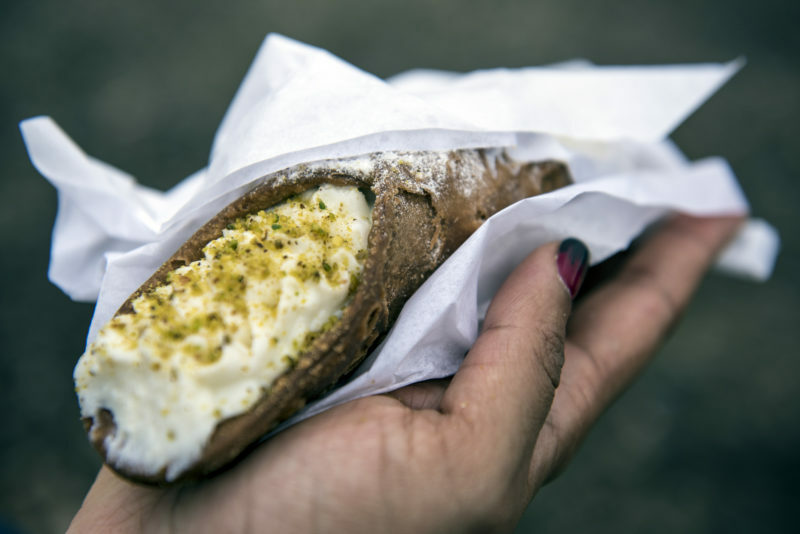 “I’d say we’re Sicilian first, and then Italian,” says Aureliano Garozzo, a food guide with Street Eats, who takes us around Catania. At Antica Rosticceria, a hole-in-the-wall takeaway in the market, opened in 1910, Agatha Fisichella and her son Roberto have taken over her late husband’s great grandfather’s stall. Table de calda (hot table snacks) may include rice and cheese filled arancini, cipollina (pastry pockets), scacciata (cheese calzone), thick-based pizette or sfinsione, chickpea panelle and potato croquettes. 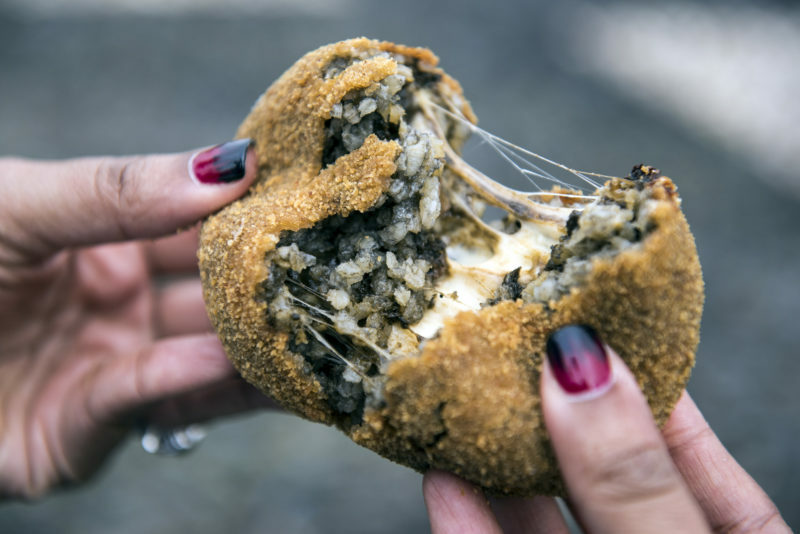 These hearty, €1.20 bites fortify the idea that Sicily must surely be one of the original street food capitals of the world. Thirsty Sicilians know to grab a green or orange-coloured mandarin sciroppi or soda from the kiosks around town – a tradition from the old days at the markets where men would sell a refreshing drink of water to patrons. Some play a game of drinking the soda before the bicarbonate of soda poured in results in it flooding the counter. A local in Palmero tells me that the drink, which resembles an antacid in this form, is the perfect digestive. It’s acceptable to burp loudly, she adds. Admire the main duomo (cathedral) in each city – it’s usually the liveliest section in town. A visit to the archaeological park with the Greek amphitheatre and take a boat ride in Syracuse.